Nate Miller's Tabletop Games: Under painting and glazing speed painting technique. Under painting and glazing speed painting technique. I've got tens of thousands of miniatures and only perhaps a couple thousand of them or so are painted at any given time. 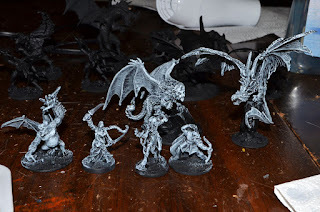 I used to have more painted minis but I sold off several of them in the late 90s. Since then I've been better at buying miniatures. 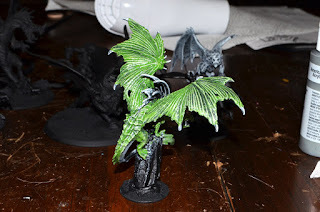 I'm a pretty fast painter and I'm usually looking for nothing more than a decent table top standard on my finished minis since I am painting them to game with. Recently I've been using a glazing technique over a black and white under painting to achieve suitable results. The dragon above is painting using this technique. Although it is not the best result I have achieved using this technique it's the miniature I used for this tutorial so I'm showing it here. I think it turned out fine for the purposes of this demonstration. I've always felt Green Dragons should have a plant like feel. 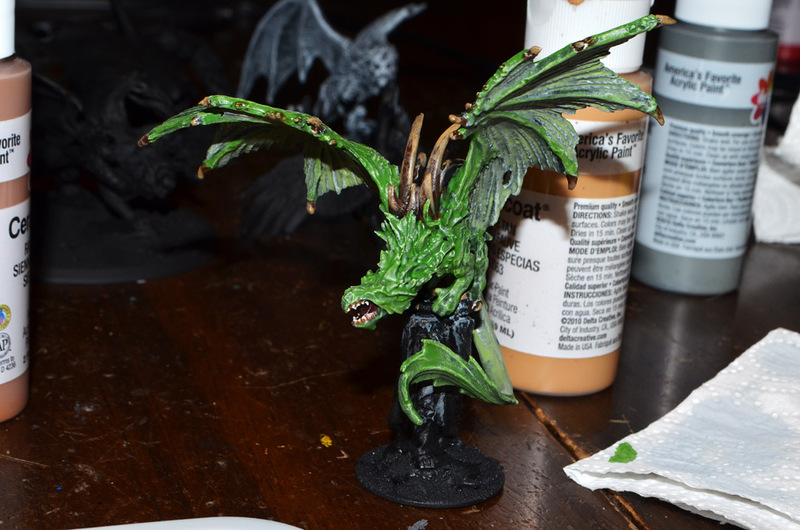 The dragon's spikes were supposed to look thorn like so I think I managed that with these results. I start out priming my miniatures black. I spray primed these but you can hand prime them if you prefer. I've hand primed with this technique with good results. Then you need to select some medium and light grey paint. I have used dark brown over painting with brown and tan for warmer shades. I always use nicer craft paints for speed painting because I'm cheap and because they work just fine for table top quality paint jobs. These Delta Ceramcoat paints give the best results compared to the "pro" paints various miniature lines have. 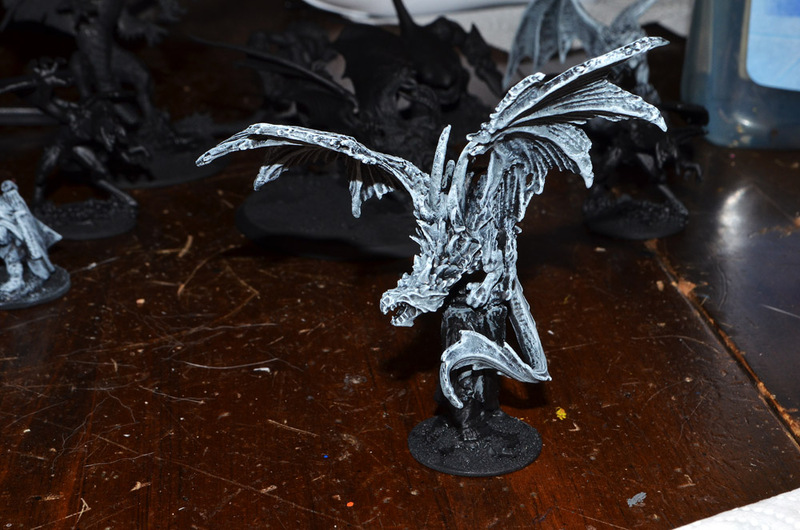 They are still much cheaper than miniature paints but they are higher quality than most craft paints. 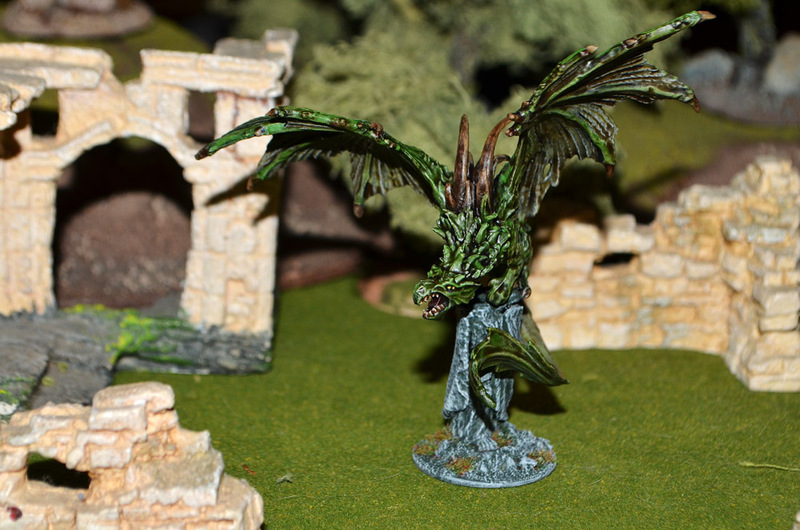 If you would rather use miniature paints by all means but it's a bit of a waste for the under painting. For brushes I chose these inexpensive flats I picked up at Walmart. You don't want to use nice brushes for this technique but you don't want them so cheap the bristles fall out and stick to the minis. You're going to want to use a drybrushing technique with the medium grey for the first layer. 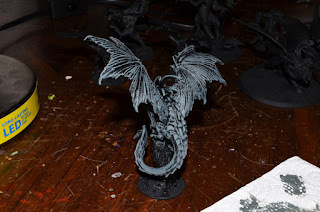 If you want the miniature to have a lighter over all result you will want to cover more of the black and only leave a little showing through. If you want a darker over all result then leave more of the black showing. 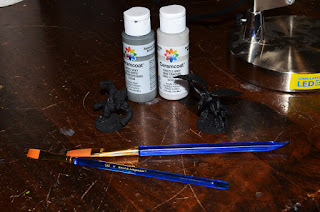 I usually keep my brush damper during the first stage of the under painting because you want to cover more of the black base coat but you don't want the brush too wet. If the paint is getting down into the deep crevasses you need to clean the brush and start over with a dryer brush. I'm using Delta Ceramcote Hippo Grey here. One thing I can't stress enough when doing any drybrushing technique is that you need to clean your brush out frequently. In terms of drybrushing you don't want your brush bristles to get dry and too gummed up with paint. This is usually the downfall of the drybrushing technique. 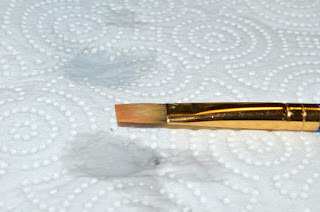 When the brush gets gummed up with paint it is hard to control were the paint goes and it will also damage your brushes. After you put the medium grey down move on to your light grey. 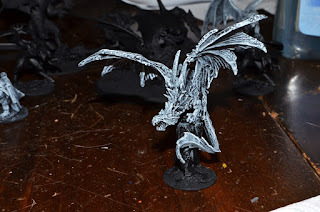 This will form the base for your highlights so you want this grey to be fairly light. I'm using Delta Cermcoat Drizzle Grey as my highlight. Here I have painted several minis at one time. Since this is a speed painting technique it works well for rank and file even though these are all different minis. Make sure you don't go too heavy handed with this layer. You want to pick up the highlights but you don't want to completely cover the medium grey. You will want even less paint on the brush for the highlight and you want to avoid letting the brush gum up so wash your brush frequently. Just make sure you get the bristles dry after washing. You might want to employ a hair dryer on the lowest setting to help dry your brushes after you wash them. 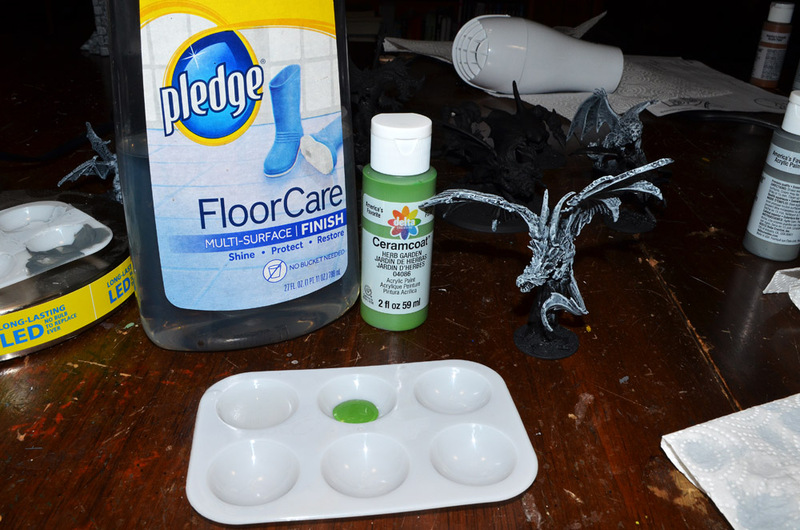 To make the glaze I use floor polish like this pledge household finish. The old model/miniature painting standard used to be "Future" floor wax but I believe that Pledge bought them out several years ago. This provides the same results as the Future finish either way. There are artist glazing mediums on the market but I find them too thick to use with miniature and models. They are meant for canvas painting and like artist acrylics they aren't that useful in miniature painting. I usually add the finish to the paint using a brush as I got. 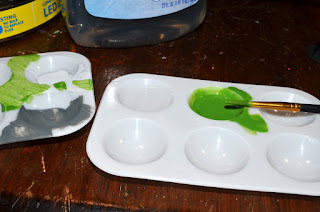 Add it to the side of the rim of your pallet so it flows down into your paint before mixing. This makes it easier to avoid contaminating your clean finish with pigment as you go. Then use your glazing brush to mix the finish and the paint. If you need to add more finish clean your brush before dipping it to avoid contamination. You will have to judge the consistency of your glaze based on how intense you want it. As you can see on the pallet on the left I used the dried grey highlight paint to judge how my glaze was going to cover the model. If you want to be really fancy you can get some white card and paint a black, medium grey, and light grey stripe on it then drag your glaze brush across the stripes to judge how your glaze is going to cover each layer. I like glazing with a soft round but not a super soft one. Your looking for something with flexibility but not so much you loose control of the paint. I like soft synthetic bristles. Rather than stiffer hog hair or softer sables. Carefully lay your glaze over the surface of your model just like you would a thin layer of paint. Glazes are easier to control than a wash but harder than paint. I usually work largest areas to smallest. Even though this is a peed painting technique it does require a decent level of brush control. Be careful to put the glaze only where you want it and be especially careful not to get darker glazes over areas that you want to be a lighter color. I have had to go back in and carefully layer paint the grey under painting on details when using this technique because I got too sloppy with my glaze. Be careful not to get your glaze too thick either or you will wipe out the tonal gradient from the medium grey and black areas. I basically over paint the entire miniature with glazes. You need to be careful to avoid having wet glazes touching each other as they will tent to run together. It doesn't matter as much on creatures as it does on humanoids because some times the blending of the colors can lead to a more organic look. 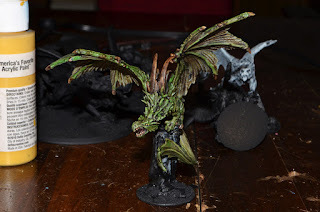 If you are only working on one miniature you might want to use a hair dryer on the low setting to speed up your drying time. Be careful to let you glaze set just a bit before using the hair dryer because you could push wet glazes over on to other areas they don't belong in if you are too aggressive. Be careful not to hold the dryer too close to the model either to avoid splashing your glaze. You can employ glazing with other painting techniques. As you can see above I have painted the miniature's teeth in before moving on. I use either dry brushing or layering on metallic surfaces such as armor on humanoid miniatures and sometimes when painting flesh tones. 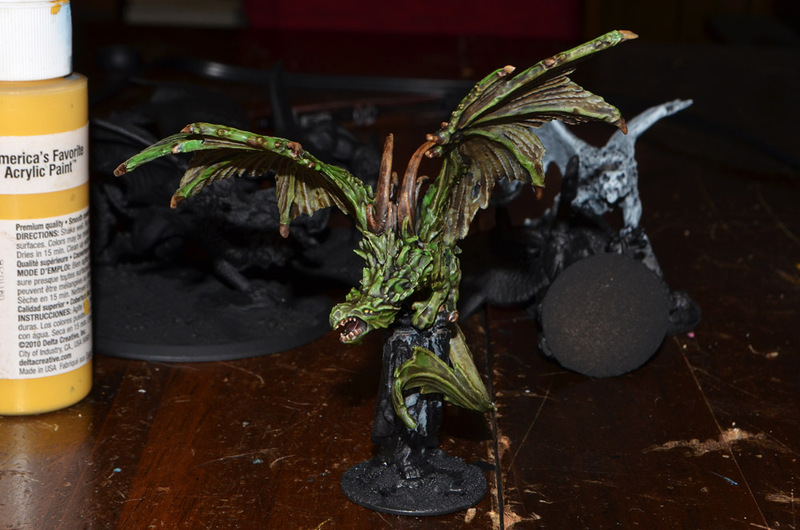 After my glazes have dried I use Games Workshop Citadel "Agrax Earthshade" wash over the entire miniature to help tie it together and provide some additional shading. I got a little heavy handed with this model. You can thin the wash down if you don't want it as dark. The wash will help fill in the areas where your different color glazes touch and help blend them together. There are some ares like eyes and bases that I don't paint until the end. You may also want to add some final highlights with dry brushing or layers as needed after the wash dries. That's basically all there is to it. It took me about 2 hours to paint this dragon which isn't too bad. I've painting 28mm character models in 45 minutes or less using this technique so it can be really good when you need to get something on the table fast. That is certainly a great technique for speed painting! Always neat to read about new techniques. Thanks for sharing! PS. I have hit or miss results with Delta Ceramcoats. They seem to have more pigment than say Americana, but I find that sometimes they are very difficult to thin out enough to paint. 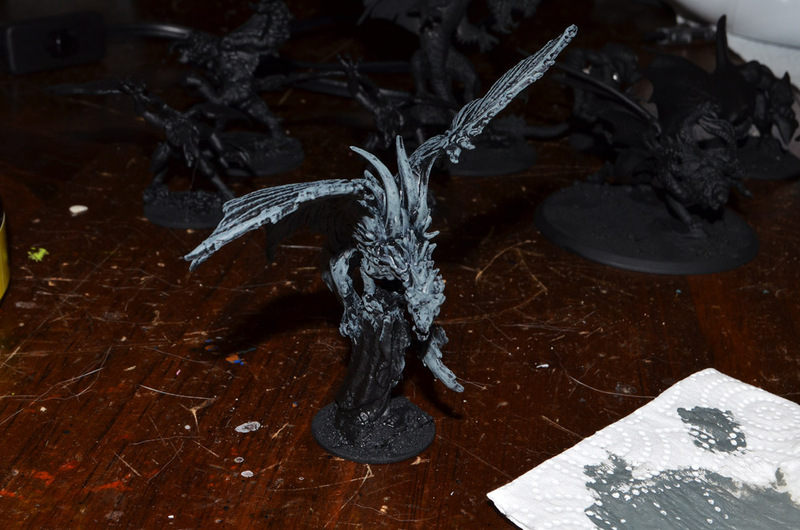 (versus using for a drybrush).